Do you like to play arcade machines and love to try out the retro games that took the world by storm during their time? Well, then you definitely need to check out the Time Crisis Arcade game machines that we have at Arcade Direct! First released in 1995, Time Crisis was a popular arcade video game that was created by the famous Namco. You would see it during the late 90’s in amusement arcades and even bowling alleys, as everyone wanted to join in the excitement of the game. 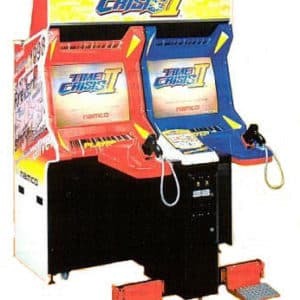 Now at Arcade Direct you can hire Time Crisis arcade games for your next big event or even purchase one of these fantastic arcade machines to feature in your home. This is sure to take pride of place! The theme behind every Time Crisis game is that there is a threat to the nation or the whole world and it is your job to save everyone from the disaster. You take on the role of a highly skilled agent and you must use your skills to fight the security threats that exist in the Time Crisis II Twin Arcade Machine. This is a twin shooter game, which means that you can play with a friend and save the world. You will play as Keith Martin or Robert Baxter and you must take down Diaz of Neodyne Industries who are launching a nuclear satellite into space. So, do you have what it takes to stop this evil plan once and for all? All you have got to do is plug in this machine and play. It is that simple to get started! Players will use a lightweight gun and point it at the screen, as well as a pedal for each player to move their character. You can choose to fight evil on a solo mission or play as a two-player co-operative mission; the choice is yours! It doesn’t matter whether you want to hire the Time Crisis arcade game for a party or business event, it is sure to bring the fun and keep all of your guests entertained! Plus, nobody has to miss out on the excitement that this game brings since you can now purchase this arcade machine and bring it home with you. We also have some great arcade machines for hire including the Time Crisis. At Arcade Direct, we have a range of Time Crisis arcade games that are thrilling and boast amazing gameplay that is still popular today. So, what are you waiting for? Join in the fun with retro arcade games!